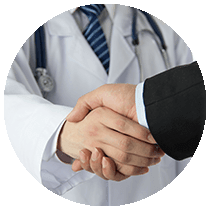 Diabetes Task Force Solutions (“DTFS”) is a team of professional healthcare providers, health administrators, and patients with considerable business expertise, to ensure that our solutions are evidence based, comprehensive, cost effective, and sustainable. 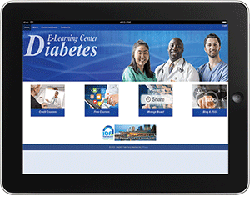 DTFS has worked with a number of organizations to develop unique; evidence based comprehensive diabetes prevention and management programs ranging from education to community-based prevention and management models, and to state-of-the-art virtual diabetes center. Our philosophy is based on empowerment and motivation of patients to play a leading role in managing their chronic diseases through culturally sensitive and holistic self-education interactive education programs; providing healthcare professionals with innovative technology based tools for better treatment and monitoring of patients; and integrated solutions for healthcare services to cost effectively manage their resources while providing efficient services to the clients. Diabetes, a worldwide epidemic, imposes significant health and socio-economic consequences on individuals, families, healthcare systems and countries. Healthcare is still largely built around an acute, episodic model of care that is ill-equipped to meet the requirements of those with chronic health problems. Successful management of diabetes, as most of other chronic diseases, requires patient-focused systems that integrate ownership by informed patients with long-term support by a multidisciplinary healthcare team. It also requires continuous supervised monitoring, outcome analysis, and continued medical education; incorporating technology for improved care delivery for both patients and providers. Type 2 diabetes, a progressive disease, requires a pro-active care to prevent health complication and its impact on patients and healthcare systems. 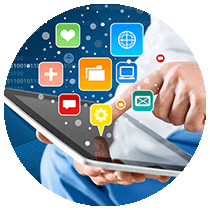 DTFS provides all stakeholders with solutions and tools to provide better patient care and improve workflow and productivity of the healthcare system. Diabetes, a worldwide epidemic, imposes significant health and socio-economic consequences on individuals, families, healthcare systems and countries. Healthcare is still largely built around an acute, episodic model of care that is ill-equipped to meet the requirements of those with chronic health problems. Successful management of diabetes, as most of other chronic diseases, requires patient-focused systems that a integrate ownership by informed patients with long-term support by a multidisciplinary healthcare team. It also requires continuous supervised monitoring, outcome analysis, and continued medical education; incorporating technology for improved care delivery for both patients and providers. Ensuring access to cost-effective diabetes care. Improving job satisfaction for healthcare workers. Type 2 diabetes, as progressive disease, requires a pro-active care patient focused approach to prevent health complication and its impact on patients and healthcare systems. We developed the Virtual Diabetes Center (“VDC”) to addresses the current gaps in the delivery of chronic-diseases care, the increasing challenges for the healthcare system to cope with the imbalance between the number of patients with diabetes and the number of endocrinologists, and to provide pro-active diabetes care. VDC facilitates the coordination among the integrated medical care team and Integrate self-management and lifestyle data with current health conditions and historical medical records is essential for management of chronic diseases. 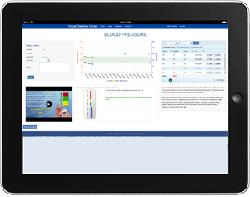 Organizing and providing such information in easy-to-review visuals enables healthcare team members to have a comprehensive understanding of the relation between patients’ lifestyle, their diabetes management, and , the current treatment prescribed. 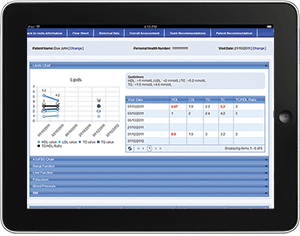 Data visualization maximizes time utilization during clinic visits, and ultimately allows for more precise diagnoses and successful treatment outcomes. VDC can also be used as a diabetes registry and could be customized for pharmaceutical and medical research. Although medical therapy is important, long-term diabetes control also depends on the choices patients make about diet, physical activity, and other health-related behavior. These choices are based on patients’ knowledge about their disease, their ability to monitor it, and their motivation to self-management behavior; hence the importance of diabetes education and user friendly management tools. Moreover, facts about diabetes, how to manage it, and its potential health complications should be presented to the patient at the time he or she is diagnosed. 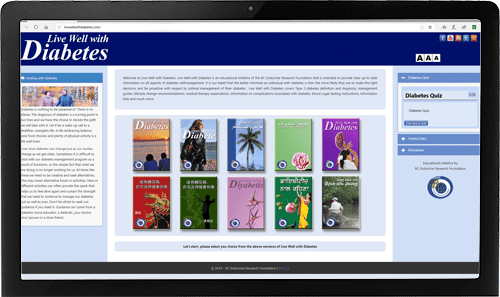 DTFS in association with BC Endocrine Research Foundation have developed a comprehensive multicultural diabetes education program, it is available as a web-based program and in DVD and CD-ROM format. Live Well with Diabetes addresses the culture aspects that motivates people to manage their health in Cantonese, Mandarin, Punjabi, Farsi, Arabic, English, French, and Spanish. The purpose of “Live Well with Diabetes” is to provide a combination of diabetes knowledge and self-management skills as well as heightened self-awareness regarding health, beliefs, needs, and goals. Individuals with diabetes can use this knowledge to make informed decisions about their behavior and act for their self-care. Family and friends can also gain understanding thereby providing a solid support network for the individual with diabetes. In addition to the development of the application, DTFS has assisted in fund-raising activities, conducting pilot project to evaluate the effectiveness of the program, and in the promotion of the program through several conferences and workshops. DTFS has produced all promotional materials and newsletters. The program was developed in 2005 and updated annually by DTFS, it accessed by people from many countries and is used by support groups and health organizations. Live Well with Diabetes is partially sponsored by most of the major pharmaceutical companies, a demonstration of successful partnership for the benefits of patients. DTFS team has organized more than 20 diabetes awareness and screening events for the First Nations communities in British Columbia. These events are community gatherings designed to share knowledge regarding diabetes between healthcare professionals and community members. It is also an opportunity for community members to be screened for diabetes. Screening tests include random glucose. 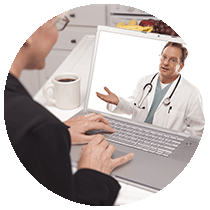 If the result is higher than 8 mmols/l, or if they have known diabetes, the A1c is tested By Point-of Care testing. Other tests were available included blood pressure, BMI, and lipids to complete a Metabolic Syndrome profile. These events were carried out with the association of BC Ministry of Healthy Living and Sports, health authorities and local healthcare communities. A Community Based Diabetes Prevention and Management Model (CBDPMM), a patient focused approach, applies culturally appropriate and holistic methods. Developed by the DTFS in partnership with a team of healthcare nonprofessionals specialized in diabetes prevention and management, as well as input from patients and other stakeholders. 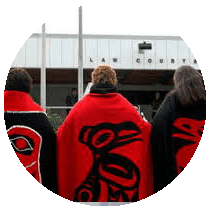 The model was successfully implemented at the Haisla First Nation in British Columbia and has achieved significant results in terms of prevention and management of diabetes and the sustainability and ownership of the disease within the community.